The thing I’ve found in London is that there are great stores and tons of them, but nearly all of them sell their wares way beyond what I could afford of I want to keep my life on the budget I’ve been working under. This doesn’t mean that I never splurge—it’s just rare and something I do only after a lot of thought. And I’ve found—as an individual who really does love to shop—whether you are wandering around a physical store or flipping through a virtual one, you can have the same basic experiences with only a few dangers and draw backs. Growing up, I never liked online sopping—even the idea of it perplexed me. You can’t run through the idles seeing what other people are holding, feel the fabric and really see and feel the details, try something on just so you can say you tried it, gage your size by trying on different sized—while the wide web of the internet shopping ethos have done a great deal to right these issues, it’ll never be the same. And I’ve always recognized the dangers (because I really like to shop!). You can now shop without making the effort to go somewhere and you can do it wherever and wherever you are which means if you aren’t careful, you will end up spending tons of money on things that were whims because you didn’t have to physically cart them back across town. Not to mention the loss (of excitement and sobering reality) of having to hand over your money to a stranger and realize that you are giving up something for getting what is in your hands—a sensation that can make your discernment process a bit stricter in terms of what you let yourself buy. And now that I’ve put in the effort to tell you all the problems with online shopping, I want to mention a site I’ve found this year and have come to really love: Chicwish. 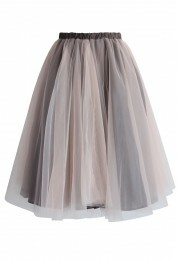 Amore Mesh Tulle Skirt. Chicwish.com. I think I first stumbled upon this site thanks to a pintrest tag after I’d fallen in love with Audrey Hepburn films. I found this wool midi skirt that just screamed Audrey style circa Roman Holiday and after giving myself a week to stare at the tag in my browser favorites, I just had to get it—and just in time for Christmas! I got that happy shopping feeling in my gut and promptly watched Confessions of a Shopaholic to reaffirm that loving shopping is good, but control is better. Back in January, I wrote a post covering my fashion wish lists—capes, plaid/tartan, and collared dresses—but I left out one look that anyone flipping through my style pintrest board would quickly discover: I have an obsession with tulle and a desire to run around town in a fashion tutu. Why was this left to the wayside then? Generally, I’m a practical dresser. Yes, I tend to lean to a carefully fashioned practicality—a cotton blazer is just as easy and warm as a hoodie—over flashier pieces and what is a tulle tutu if not a statement piece? And yet my love of them continued to flourish. I’d convinced myself for a while that I would simply make my own—I’m crafty like that—but as time went on, it became more and more clear that it just was not going to happen. Then, when I was still looking through stores, the closest I found besides petty unlined petty coats—not made in either quality fabric or true outerwear wearability to really work as a substitute—came in the form of high school dance dress which, while cute, never has the versatility I was looking for. Which brings us back to Chicwish. After my Christmas purchase, I began receiving updates from the site and, therefore, received their email about the big styles they are currently promoting, Bloom and Tulle. To say it was hard not to splurge is an incalculable understatement. 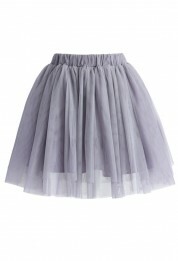 Lavender Tulle Mini Skirt. Chicwish.com. Anyway, if you are looking to purchase a skirt like this, now is the time to get looking. The site currently has a range of styles (including dresses), lengths, volumes, and colors to look through and, if my cart is anything to go by, a lot of the merchandise is on sale. I approach online shopping like you would (or at least should) approach shopping in a store. Put the stuff you like in your basket—this gives you a clear visible range of the style and individual pieces you are looking for. Then, go through the basket pulling together similar items and narrowing them down to what you really want, discarding as you go. When you have your short list, ask yourself the reality questions: when will you wear this? How often? What am I giving up for this? Is it worth it? What things do I own that I can wear with this, or do I have to buy more to make it work? Do I already have something that makes this redundant? Once you answer these, you’ll discard what you don’t need, save what you still have to think about and head out to buy what you have really thought about buying—this can easily be a week after putting it in your cart (depending on availability)—one of the convenient positives of having the store at you fingertips! Like I said, I love shopping, but it’s about shopping well—a skill that is honed just like any other in your arsenal. And Chicwish and its unique pieces, for me, definitely makes the cut in this city I can’t really afford and yet love so much. The Darling Buds: One hell of an evening. Have you ever have left a show with the instant need to plug back into the music and dance across town until you finally pass out in bed for the night? The kind of show that leaves you singing for days? 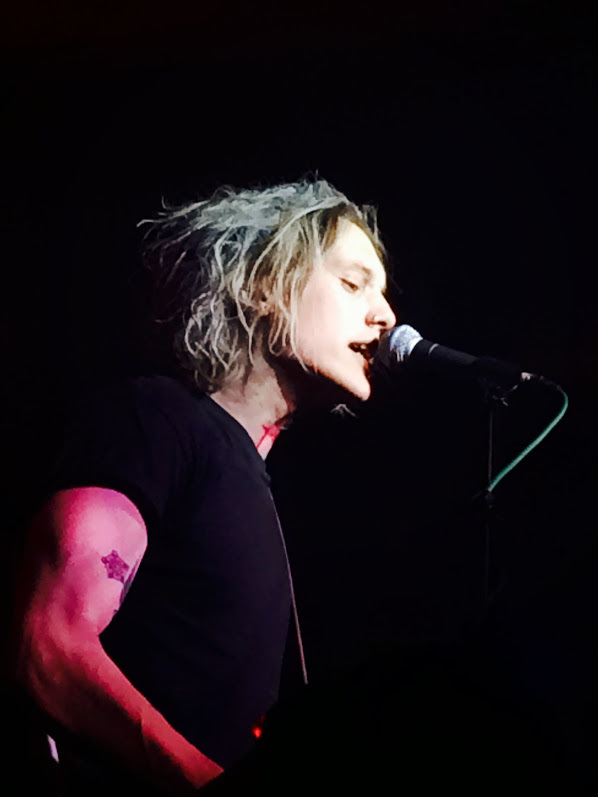 Well, see a show by the brit boys The Darling Buds and you almost certainly will. Huxton Square Bar & Kitchen is made up a three smaller spaces: a restaurant currently advertising their pizza selection across the website; the bar which I didn’t see much of except that it was pretty packed (though this could have been an irregularity due to a show night); and, finally, the back room where the show takes place. The backroom is decently sized to rival any small club venue. Nowhere on the floor seems too far away from the stage so really only the crowd itself may become a sight issue. At the back of the room is a second bar so you can keep drinking through the wait and opening show without fighting your way through the other crowd outside the doors. I set up along the left side of the room right by the stage stairs. You may be tempted to get into the center stage area and I don’t blame you—I’ve done it myself countless times—but why fight for that when this spot gives you everything. I wasn’t at the front of the line to get on but this space was clear. There was a table sticking out from the side stage storage compartment that was a nice storage space for a jacket if you are willing to risk it and a nice lean space in the long wait periods before things get to crowded. This spot is between the two spaces the talent—if you will—passes through—the stage stairs and the door to what I can only imagine is the greenroom—which is quite interesting. 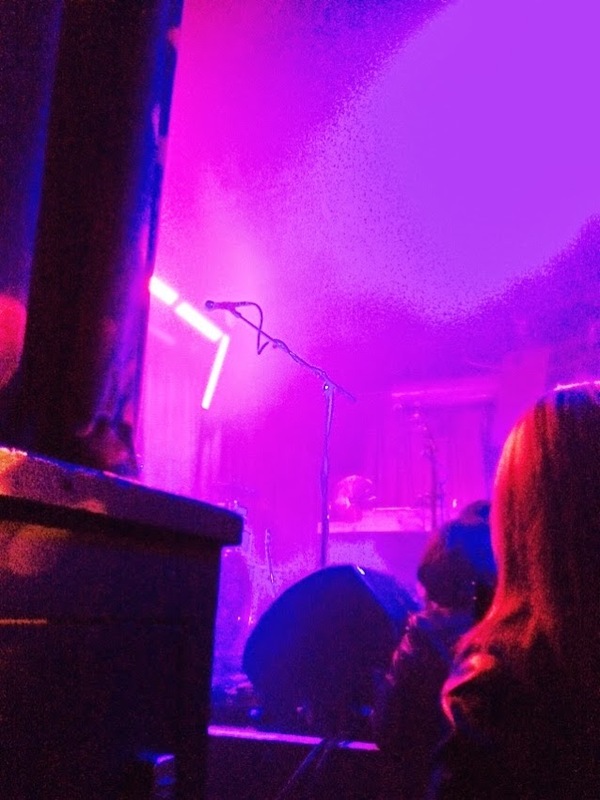 The view of the show is great as long as your there for the music and not just to grab at whoever is on the stage. If you want to see everyone on the band, you’re a little far to the side for a really clear shot but honestly you shouldn’t have anyone knocking into you and space to dance around. The opening act was a quartet of boys from York called Hello Operator. I couldn’t place the ages of the band but they were young with quite the interesting sound. Oh, and they were very polite as they passed us on the way up to the stage—very nice boys. They played a good set but the interesting thing which really stood out was the front man’s voice. It was the kind of voice that sounded like it was coming from somewhere between the back of neck and a head voice—a slight whine but with an unexpectedly strong edge. They had a great stage presence however their age showed in some of the movements which seemed slightly stilted and rehearsed rather than something fluid or organic. Because of this I found myself watching the singers hand on his guitar rather than his larger physical movements—the glide of his fingers from one chord to the next was the opposite of the larger movements—well practiced and precise to flow with little effort. Despite this larger stilted movements of halfhearted headbangs, I read an underlying and undeniable talent in a moment that could have ended up a disaster. After fumbling with pulling a pick out of his pocket, the lead singer strummed a measure or two before dropping the pick and moving on like none of it happened—completely smooth. I’m not sure which parts of this were timed and practiced and which just happened but between this and the sounds they produced, these boys are worth keeping an eye on. I’ve been lucky enough to see The Darling Buds preform twice before back in LA and, if I’ve learned anything from these shows, I’ve learned that they never disappoint. Listening to them play live gives you a totally different experience than listening to an album or even rewatching the shows in YouTube—which there are plenty to choose from, by the way, if you want to give these boys a listen. From the change of inflection in every show to the added expletives to the ways they interact with everything around them, this is a band I can go see over and over again without regrets of either time or money spent. There is always something worth seeing when The Darling Buds take the stage. If you’re looking to only hear the band play, you’ll be out of luck. The crowds who flock to these boys know every word to every song and watching the expressions and the bits of language which spill from the boys is well worth listening to crowd scream lyrics back at the stage. They seem to be preforming pretty regularly, and still are blown away from the audiences enthusiasm and they definitely embrace and even play with that spirit whenever they can. If you end up in this crowd and don’t know the words yet—one of the lovely ladies I met last night didn’t—you won’t be left out. The sound these boys make lets you rock with the crowd and you don’t need to know anything more than how to appreciate good music to get swept away with the rest of us. I went to this show alone but was quickly welcomed to scream and sing with a small group of fans—dancing and just enjoying my night. And from what I can tell, this isn’t an odd experience in this global group that is nothing short of a fandom. There are no outsiders in a room like this and that’s just one of a million reasons I could give to go see these boys in action just as soon as you are able. I’ve been to a lot of concerts throughout my life in all kinds of venues and musical genres, but it is bands like this ad venues like this that really make the experience of standing in a small room, dancing like an idiot, screaming until you can’t speak for days and ending up covered in both your own sweat and the sweat of who knows how many other equally excited people that makes me come back time and time again. When it comes to watching a show put on by these lovely men, my recommendation above all else is, when the crowd really gets going, stop looking through the camera lens you’ve no doubt been filming through—seriously so many videos!—and just look at Jamie Bower and the rest of the Darling Buds’ faces as they listen to the crowd sing. That’s love and that’s the reason you should love these boys and the noise they make. It sweeps you up and definitely feels like magic. This post is a quick plug to let you all know what’s going on. I’ve been working like crazy but tomorrow night I’ll be heading out to a concert by “The Darling Buds”–they don’t have anything too official out yet but look them up on YouTube if you’re a fan of music-making Brit boys! Because of the timing of it and me not wanting to wait almost a whole week to review, I’ll be posting up a review about the night by Sunday evening and then be back on schedule with a few Fashion Fridays the following weeks. And for one #FashionFriday sneak peak at planning for a Satifying Saturday, How about some Sequins and Spikes, Sparkle and Studs? Have a great weeknd; I know I will. I’m back… and still a nerd. Beautiful books! 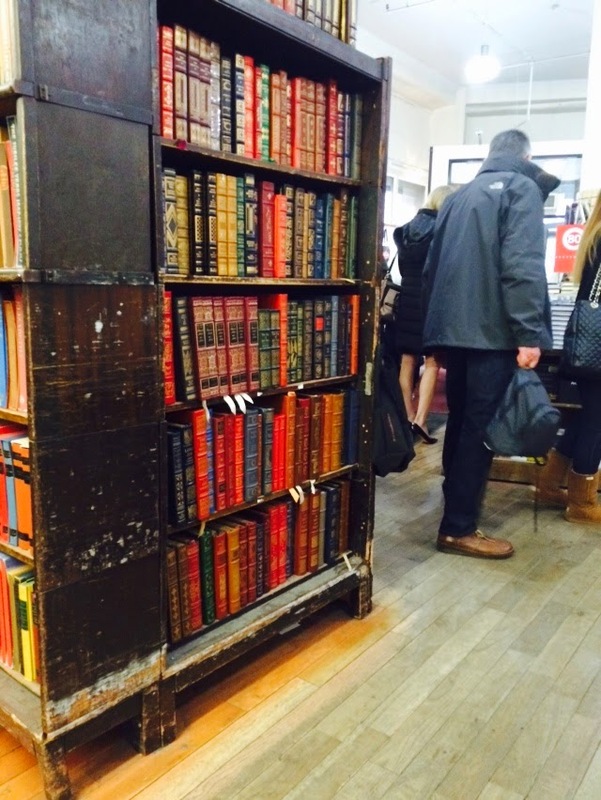 Strand Bookstore, New York. March, 2015. First off, my apologies for the sudden month hiatus—the end of the semester and a quick and unexpected trip to New York got me off my game. But if you’ve been reading my other site, you’ll know my book nerd lifestyle continues. And in all seriousness, I have to say they are taking over my life—and I’m not complaining! What I want, however, is time to read all of my books—is that a good enough reason for the ministry to give me a time turner? So multiple Taylors can sit in different rooms reading all the book. And yes, I mean all the books. I’ve been running around so much this year trying to get all my work done, think about my future, have a social life(? This might be a lie…), and all those basic necessities you need to do to survive that reading seems to have fallen to the side of things. Not sure if it’s a good thing or not, but I’ve developed a “Tsundoku,” or the Japanese word for a pile new, unread books that tend to come together—seriously? How is that not a word in English? Anyway that’s not to say I haven’t been reading. My constant trips to bookstores whenever I travel keeps reminding me not to mention my dissertation and Classic Alice reminding me weekly about all the great classics that I somehow missed in my life as an English major. I’ve read Beawulf, Chaucer (both times in middle-English! ), and many others from Early lit at least twice, yet Nineteen Eighty-Four, The Scarlett Letter, and so many more huge and obscure titles: nothing! Cecelia Ahern’s How to Fall in Love—I think this is my fifth or sixth Ahern novel and she’s brilliant. I started reading her while traveling through Ireland with my sister which totally set the mood of the trip. She really is just compelling. I won Lev Grossman’s book The Magician’s Land in one of Classic Alice’s campaigns but didn’t realize it’s the third installment of the series… so I will need the first two. Reading the summary, however, I’m excited to get into the story! Neil Gaiman’s Neverwhere—I’ve never read a Gaiman book before which is really shocking for me. I grew up a Terry Brooks girl so I was always in the section but I figure this is an interesting start with this author and my year out here in London. Allison Burnett’s Ask Me Anything—as a blogger and millennial, I feel like this is an interesting area to look at. I watched the Film (also directed by Burnett) last night and it was fantastic! It feels a lot different than most of the stuff I’ve been reading so I’m excited. I’ve really got to work through the rest of Diana Gabaldon’s Outlander series. I finished the first one right after the first few episodes came out and now I have the next two waiting for me. None of these are in any particular order by the way. Anyway, there you have my book nerd life—a life in books. Never enough hours in the day. Let me know what books you’ve got in your very own “Tsundoku,” what you’re reading now, or coveting for later. Read on, my darling book nerds, read on!